The project renovates almost every square foot inside the 66,700 GSF NCRB for an improved user experience. 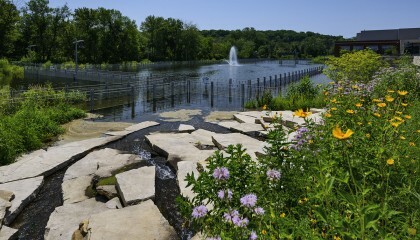 The mostly opaque three-story steel and masonry structure was constructed in the late 1970’s, and unfortunately suffered from a distinct lack of natural lighting, and beneficial transparency. New transparency in and around the new main entrance and main south facade, combine with significant interior changes, including improved circulation, transparency and functionality in the newly renovated NCRB. 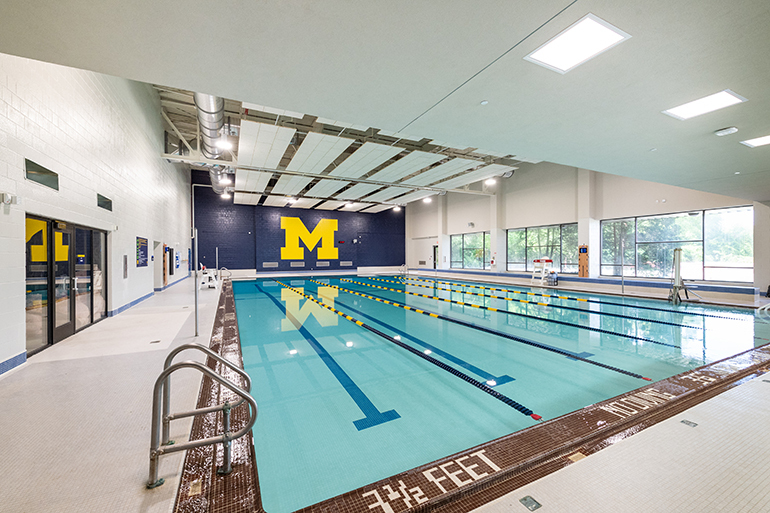 “The NCRB renovation helps to balance the university’s recreation offerings with the needs of its campus populations,” says Mike Widen, director of recreational sports. 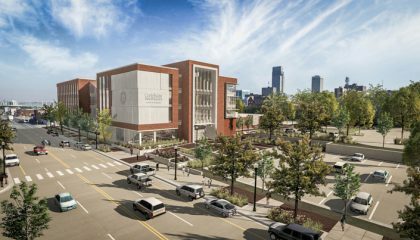 “Each of these renovations include the modernization of decades-past infrastructure, optimizing sustainability efforts, and transforming dark, small-windowed spaces into naturally lighted facilities with brightness and movement in order to enhance the overall campus recreational experience. 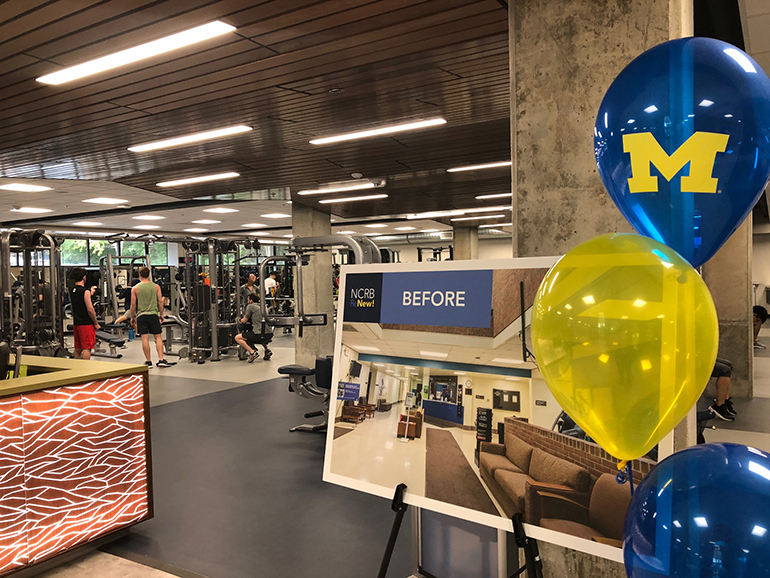 The project repurposed existing, underutilized spaces to improve cardio, strength and group exercise areas, as well as enhancements to the building’s entry. 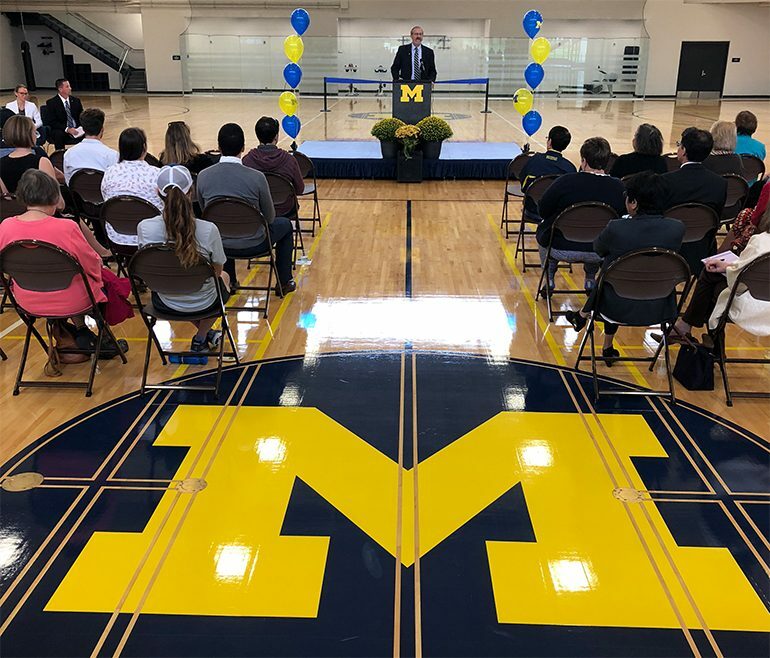 The renovated building also now features improved racquetball and squash courts, a sauna, and a resurfaced running track, while providing accessible locker rooms, a gender-inclusive locker room and restroom. A light-filled, welcoming entryway and lobby. Wide-open spaces for strength and stretching. New space for Group‑X classes. A refreshed pool area, pool infrastructure and on-deck sauna. Updated gymnasium courts flanked with functional fitness spaces. 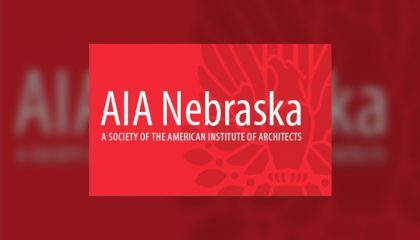 Racquetball and squash courts — featuring adjustable walls — that are at a competitive international level. Windows in the second-floor cardio space allowing for views of the wooded North Campus grounds.